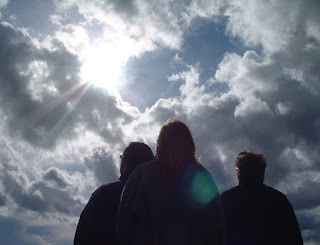 Look at that sky, and all the day spent on spinning down out of it! 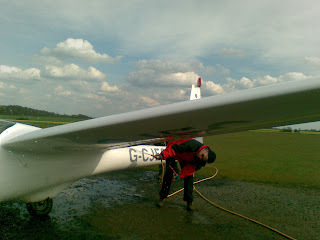 Here's Jane perfecting the lost art of glider washing by hosing Gransden airfield off a Puchacz. She has yet to finish off the course with CFI Andy and is still 'only' a BI. The 9 day course was hard work but very enjoyable and interesting, being an excellent round up and consolidation of everything we'd learned (or skipped) during our flying careers to date. The flying-while-talking was challenging, but got easier with practice, and even the dreaded Bronze paper proved not to be such a hurdle with a bit of prep. The coaches were great, very encouraging even when rubbishing our latest efforts. We had to contend with some mega hailstorms. which meant yet more briefings, and the final weekend rained us off completely, leaving a bit of flying to complete with Andy. 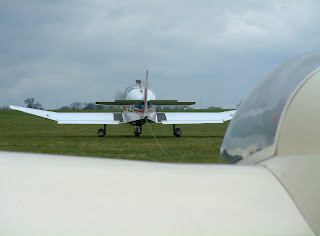 It's not a cheap way to spend a week but it's certainly well worthwhile if you want to improve your flying. There's nothing quite like the feeling of a well held off landing on a well manicured lawn. Keep going John, 24/06 next please. 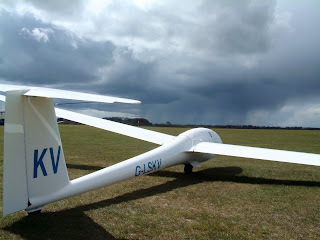 I'm getting a little fed up with April showers now, can we please have some nice soaring weather? Pictured here is John W rounding off some of those sharper edges with Martin Ff. Jeff W, Rolf and yours truly tried their luck in the Junior - Rolf won - timing his flight to perfection in strong lift between the showers. 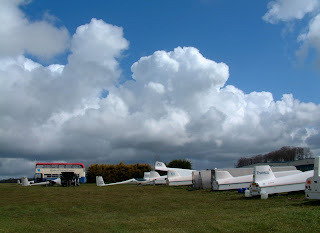 Bryan and the Monday evening group took over the airfield at 5.00pm with the sky looking as good (and bad) as it looked all day. (Hope that K13 fitted in the hanger or I'll be in the doghouse.....). 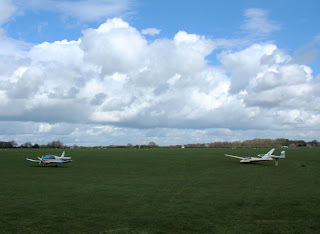 With a good southerly blowing on Saturday, Booker decamped to the rarely used countryside at the Northwest corner of the airfield. 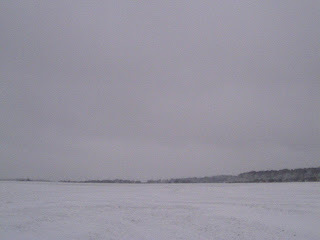 Far from the thrashing helicopters with just the skylarks and occasional Spitfire for company, what more could you ask? A little flatter in places I hear all the private owners shout! Good lift was to be had all day with milky skies tempering the sun's rays and probably keeping the showers at bay. 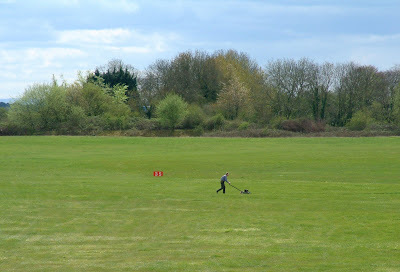 The grass is a little lusher at the 17 launchpoint as Mike G found out when he tried to move a K21 single handed. You're going to have to feed your lad better Jon. 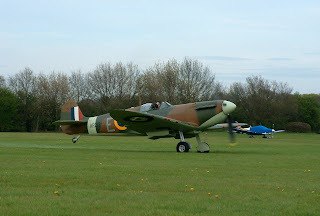 Sorry I know this is a gliding blog, but who can resist a Spitfire picture - you can almost feel that Merlin can't you? Sunday dawned brightish, and full of renewed vigour after Saturday's country air, we got 2 K21's, a K13, a Junior, a Pegase, a Robin, a Cub and the Falke out. Crash bang wallop and we put them all away again. Back to clubhouse smelling like wet dogs and a few coffees later, we decided to tempt fate with just 2 K21's this time. 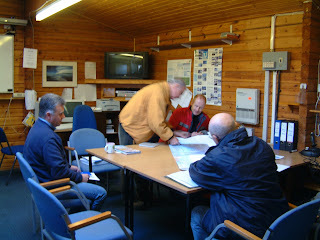 Bob S finished his AssCat course with CFI Andy - well done Bob (and Jane as well). Hopefully they'll post something soon about their course - hint. Must get some of those cool instructor shades. 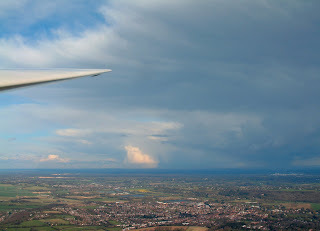 As the weather picked up Paul B rigged his new ASG29 with winglets worthy of a 737-800. Personalised plates as well, what more could you want? Today a Robin, tomorrow a Spit or Harvard perhaps? James the Pump is pictured here landing MM against a more exotic backdrop than the usual Spam-Cans. 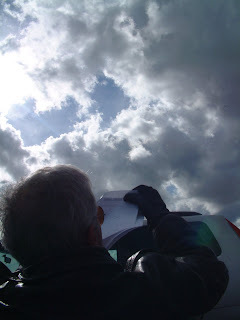 A pleasant morning with good lift was spoiled by increasing top cover during the afternoon but that didn't stop us having a very interesting time on the instructing front. Better luck tomorrow. Ideal for Pooh but better to be inside at Booker. Nice sequence showing how gusty the wind becomes during squally showers as the "Camera Enclosure" is rocked from side to side. Active trailing edge to the shower shows up very well. During the Summer season we have some slots available on a ad-hoc basis for midweek tugging. If you'd like to help out please sign up using the new list on the club notice board. More details available from Bob D. Existing weekend rota is unaffected. What better way to end a busy day at the office? Good flying, good company and spectacular sunsets with a beer in your hand after the flying's done. 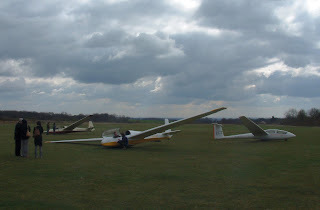 Local sunset is now after 8.00pm so there's plenty of time to enjoy the full range of gliding and motorgliding activities when the airfield is a little quieter, the air stiller and the thermals wider! Don't forget to let Shelagh or Hilary in the office know you're coming! Monday's weather continued the showery theme as can be seen in this first video of a boiling cloud street in the late afternoon. A few dropped frames (due to the longer WiFi range to the 06/35 launchpoint) account for the jitters, hopefully we'll have that sorted when we move the clubhouse antenna soon. Tuesday by contrast saw the wind backing and a ridge of high pressure begin to put a lid on the convection as this next video shows. It looks set to overdevelop first thing but then gradually settles by lunchtime. 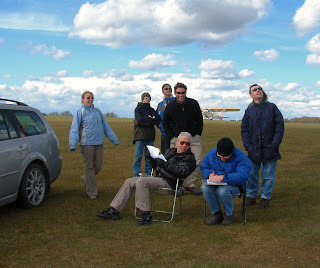 This weeks course is for our up and coming pilots who want to get ready to fly the nest. Run by Bryan H and Grandad Glen (congratulations!) it looks like being a good week. Seen here is a demonstration of that long lost art of how to fold your map. Good luck to Don H, Hugh, Simon P and Peter T.
I love April weather, there's no shortage of action, and every day is subtely different. We weren't so lucky in missing the showers today which built quickly all around. Undetered, Jeremy started the day off rigging his newly acquired share, ably assisted (and advised) by no fewer than four instructors. Jim's seaweed didn't quite gel right - Monday's the day evidently - so a bit of fettling was in order. 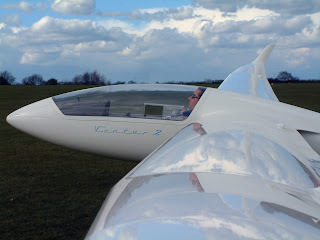 However, John G, Ben and Dan, flew cross country dodging the showers between Oxford and Avebury arriving back late afternoon between yet more showers. Jeremy also managed to avoid the rain arriving back just before the deluge. Well let's hope next week has as much excitement, there's never a dull moment in April at Booker. 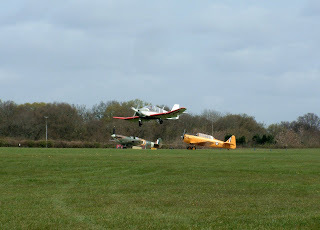 Booker's aptly named annual aerobatic competition (normally run at Easter) drew its usual wide field of contestants today and provided great entertainment throughout the day. 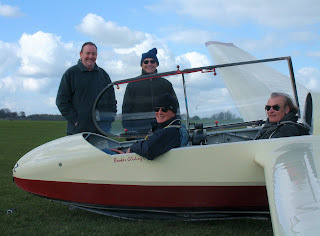 Thanks to Graham for organising, Robin for scoring and Alun and Gary as safety pilots. I'll not say anymore about the competition as I'm sure Gary will post something later when the results are in. However here's a few piccies to be going on with. Can you change a fifty quid note? Judge, scorer/ treasurer and hecklers. 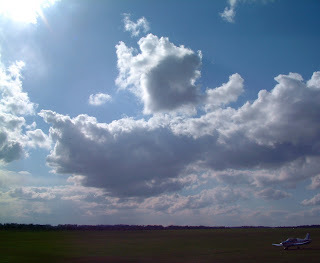 We were blessed again with fantastic weather and not a drop of rain, hail or snow fell on the airfield today. Excellent lift was to be had under the cloudstreets which seemed to go on forever. Neil takes a nap before launching after a hard day's instructing. Whilst the usual suspects look on. 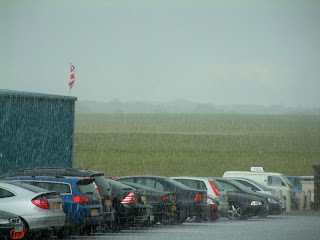 A day of sunshine, showers, donner and blitzen, greeted our intrepid aviators on their solo course today. The weather unfortunately proved too extreme for them today, so only Leon who soloed on Wednesday was lucky enough to earn his wings. Well done Leon and commiserations to the others - George the Ancient, George the Modern, John W, and Don S. Keep up the good work - not far to go now! And thanks to Martin for all his hard work yet again! There were some really spectacular showers as the trough passed through around midday, accompanied by large hailstones, numerous air to ground and air to air lightning discharges, plus strong gusts and considerable changes in wind direction. Better to be on the ground looking up than vice-versa as Martin will no doubt agree after his considerable soaking. 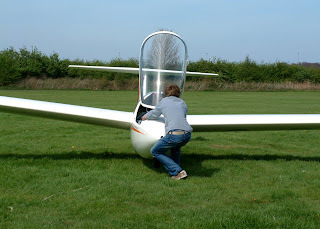 Meanwhile Phil C began work towards his BI rating - not the day for a trial lesson though - but a good challenge for Phil! Sorry but the electrical budget doesn't run to a heated camera enclosure. Pretty though as the condensation clears to reveal Didcot already active at 07.30. 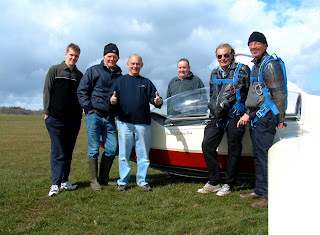 After his last successful "Get Your Solo" course, Martin Ff is pictured here with his new students, Don S, Leon and John W, who all hope to go solo by the end of the week. Good luck to you all! 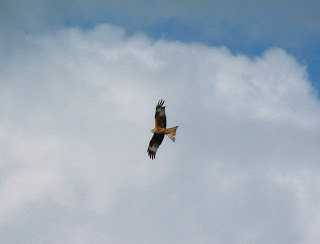 Ever watchful of their fledglings, nature's consummate soarers are never far away to mark the early morning thermals. Although getting a little frisky at this time of year you can still get quite close before they seem to turn themselves inside out to avoid the great white predator. Another beautiful sky was packed with energy albeit after a slightly delayed start. Where were all you hot ship jockeys again?? Still too cold for you? 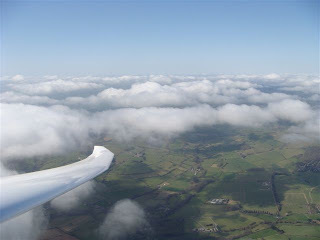 thermals to a 5000' plus cloudbase. but don't miss out next time! 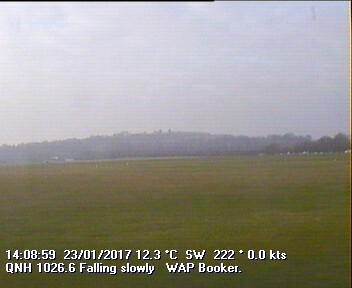 With a cold front fast approaching a prompt start ensured that all the trial lessons and booked members were flown by 12.00. The official going on 35 power was "too soft" so with a gentle 340/15-20kts breeze we started on 24. 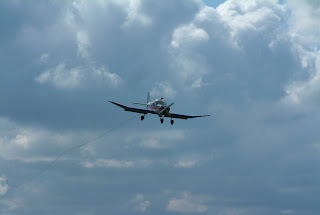 A couple of tows, and an interesting Cessna final turn over the Blister Hanger later, we moved to 35 integrating with the small amount of power traffic who bravely remained on 24. 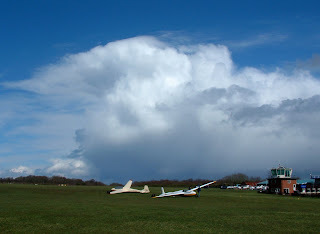 By late morning the decision to start early seemed justified with towering Cu and showers breaking out around the field. However the weather gods were kind to us with some good, if not interestingly positioned, thermals holding our attention until early afternoon. But the best lift was to be had later with 6-8kts along the edges of the showers before we finally admitted defeat at 3.30. A fun day for all who participated including those who only practiced rigging. 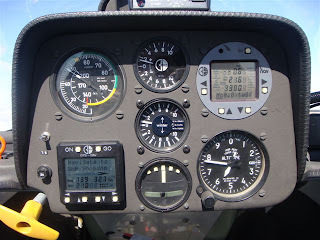 I've decided to give up weather forecasting and just turn up, rig and fly, or if you prefer just turn up, rig and de-rig, whatever takes your fancy. 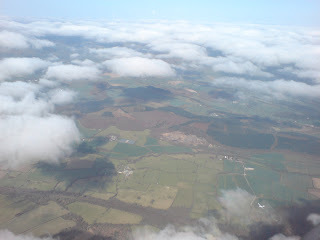 The Radio 4 weather man mentioned 'mountain wave' on Thursday morning, and wave there was. 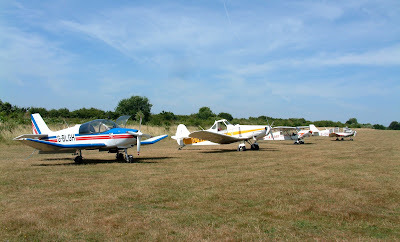 The entire fleet was off the ground, Dave B and Jeremy in 315, Mike P and Rolf in Mike's new Duo Discus T (remarkably similar to Andrew's), and Glyn and Steve B. Later in the morning Dave R and Heggie took 315 into the wave. After lunch the wave collapsed and the team was forced to make do with thermals. 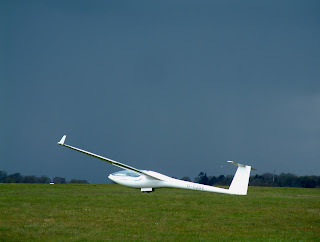 Despite rain and roadblocks we made it to Shobdon where as usual we have been made welcome by the members of Herefordshire Gliding Club and the other airfield users. Saturday was a day for exploring the excellent cafes of Leominster but Sunday was completely different. By the time Heggie had set his clock to BST and arrived with LH to tow for us we were rigged and ready to go. 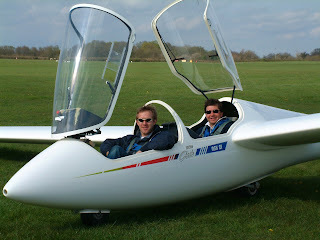 Andrew and Dave R did a quick sortie in Andrew's new toy, a Duo Discus T, then Jane took over as First Officer and they headed for Wales (which wasn't working), Ludlow and Long Mynd. 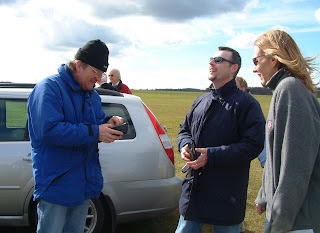 DR took Graham, John B and Rolf for checks in 315 and then John flew 318. Glyn also took G1 to Presteigne and back. 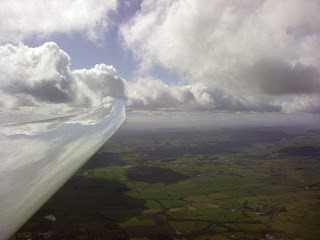 Cloudbase was around 4500ft with max 6kts average. 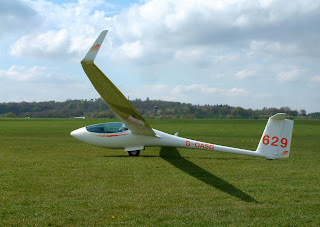 Monday was less exciting but we had some very pleasant local soaring with base at 3800ft and 3kt climbs. 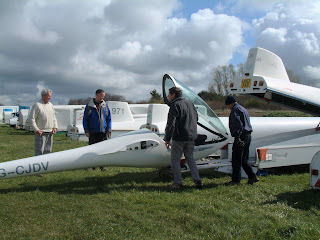 Andrew and Jane went to Ludlow twice, Glyn did Ludlow/Presteigne, Dave showed Graham how to roll on a heading, Rolf had a flight in 318 and then went to Talgarth with Heggie in LH while John had over an hour in 318. In the evening we went to the Radnorshire Arms in Presteigne where Andrew was presented with a birthday cake for his nth birthday. 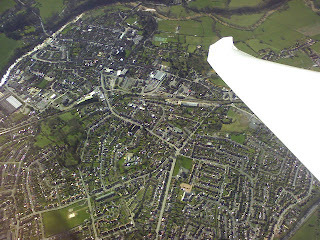 Ludlow (spot the castle competition).